Our next Games for Windows Co-Op Night is here, and we'll be playing a Relic RTS. 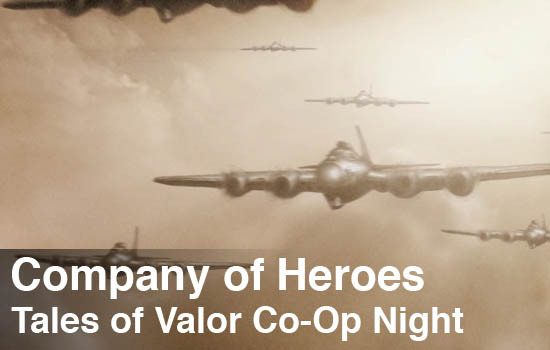 No, not Dawn of War 2 - Company of Heroes Tales of Valor! We'll be playing on Tuesday, August 25th at 8PM EDT. Plan to meet up on our Steam Channel and then it's game on! We'll be playing the cooperative mission Operation Stonewall, where up to four players are tasked with defending a town against sixteen waves of the Nazi army! As players defeat enemies they'll earn resources to build and upgrade their army. Each successive wave gets more numerous, more difficult, and more powerful so players need to coordinate together to best plan a defense of the town. We've just posted our review of the game, so you can get a better idea what to expect.